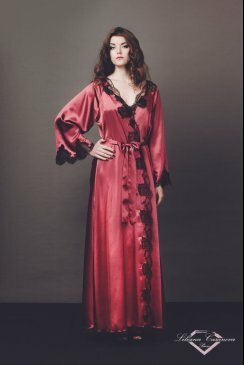 Liliana Casanova Paris has been a favorite with our customers here at Honeys Lingerie Boutique for the past 6 years, her vintage inspired silk lingerie and silk nightwear designed and made in Paris shows her couture skills in every single piece. Liliana became passionate about design when she was barley 13 years old and expressed a natural -born talent, inspired and nurtured in a couture house where her mother made couture clothing for the elegant ladies of France. 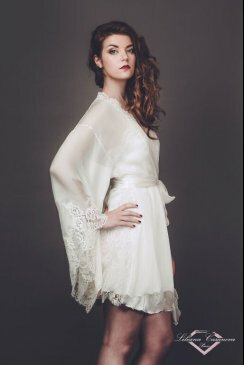 Her love of the timeless elegance of the 40 and 50's inspires her exquisite silk nightwear pieces, made in fine French silk beautiful Calais lace and with an eye for detail that only years of experience can give Liliana Casanova truly offers luxury couture pieces made especially for you. If you can imagine stepping back in time when lady's of a certain stature would have the finest couture house make their lingerie and nightwear made to order to your measurements this is what Liliana offers from her own atelier in the Champs-Elysées area, avenue Matignon. Designer Lingerie and Designer Nightwear entirely made in France, with French silk and Calais lace, Liliana Casanova is nowadays the unique and formidable representative of the exclusively French lingerie. She embodies the most treasured and praised qualities, the marriage of elegance and sensuality that made French fashion. Liliana Casanova exquisite couture French Designer Lingerie and Designer Nightwear are all handmade to order. Please place your order and select your dress size then we will email you to supply us with the required measurements. Allow three weeks delivery to the UK for this exquisite pieces and add European or international delivery times on top of this for outside the UK. The perfect gift or luxury treat Liliana Casanova is Nightwear your dreams are made of!